Nitrogen tri-iodide, or more accurately the complex between it and ammonia ranks amongst the oldest known molecules (1812). I became familiar with it around the age of 12-13, in an era long gone when boys (and very possibly girls too) were allowed to make such substances in their parent’s back gardens‡ and in fact in the school science laboratory,† an experiment which earned me a personal request to visit the head teacher. 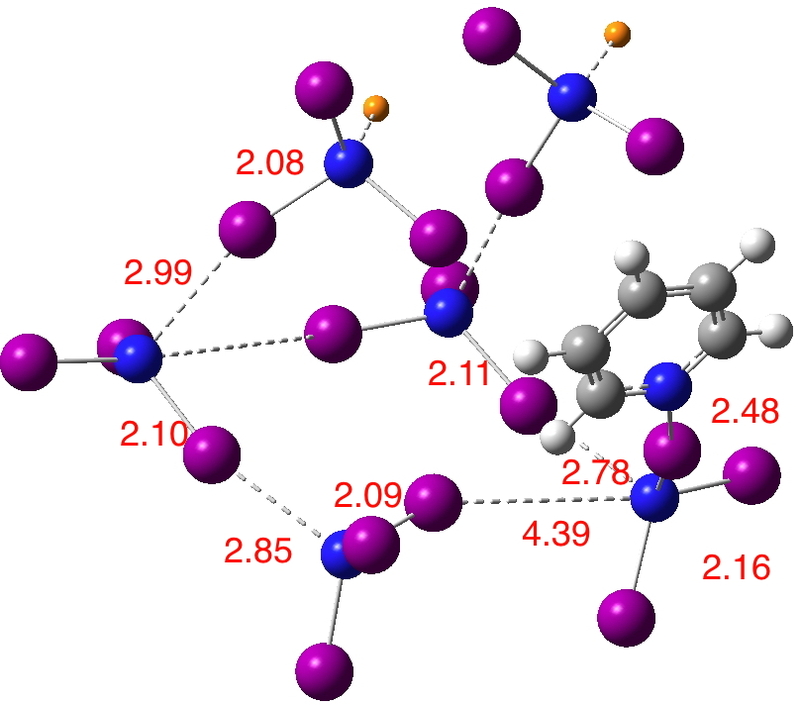 With pyridine replacing the ammonia (I presume crystallographers are often reluctant to put sensitive crystals into their instruments), the polymeric structure PYDTIN is shown below (see also IODMAM. Each nitrogen is approximately tetrahedral. As with the DABCO/I2 complex discussed in the preceding post, it consists of chains of …N-I-N-I… units, with weak crosslinks (4.31Å) to adjacent chains. Six units of NI3 are shown below, although it is clear that the term nitrogen tri-iodide does not really begin to describe what is happening. In terms of the D….X-A formalism outlined in the first post about halogen bonds, D = N, X = I and A = N. This system is in fact palindromic, since either of the N…I interactions could be described as the halogen bond. Which brings me to hydrogen bonds., D…H-A. They two adopt two forms, the first in which the proton is asymmetrically disposed to either D or A and the second where the proton exists exactly half way between. It is rather nice that this analogy also pertains for halogen bonds. More interesting however is why? So a ωB97XD/Def2-TZVPP-PP calculation on the above unit. Recollect that for DABCO-I2, the short N…I distance was in part probably due to compression resulting from attractive dispersion interchain forces. Again deprived of a full periodic boundary model, the unit above changes shape upon such calculation, and in particular the N…I…N interaction desymmetrises. Is this because of the lack of a full crystal lattice, or because e.g. a functional such as ωB97XD favours asymmetric halogen bonds? It is certainly true that for the simpler hydrogen bond, the asymmetric double-well potential and the symmetric single-well potentials often only differ by a few kcal/mol, and hence that some methods predict the same system asymmetric and others symmetric. 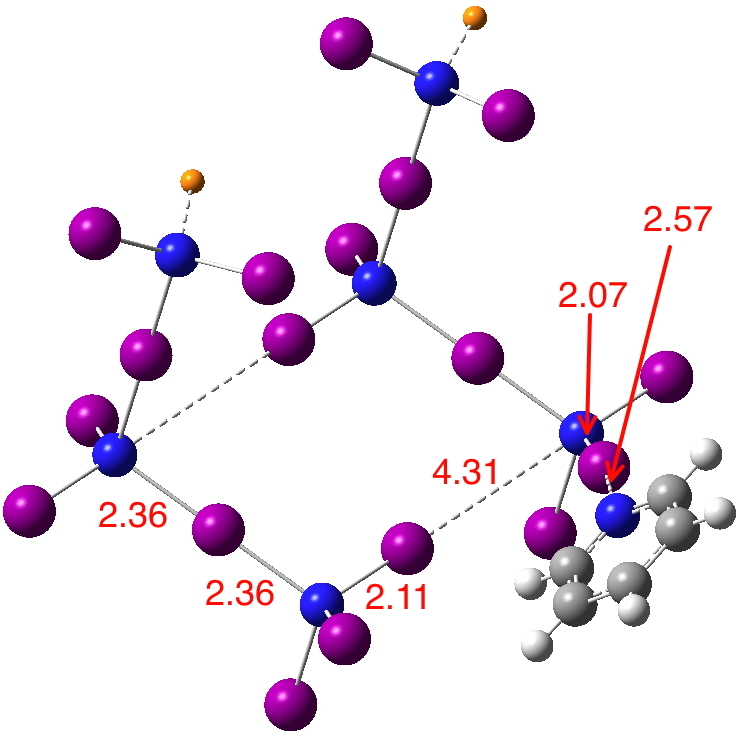 Since we already suspect that this N…I distance is sufficiently soft that it can be perturbed by dispersion attractions elsewhere in the molecule, perhaps this is also true here? I cannot here solve the issue of whether some halogen bonds exist in symmetric potentials because they intrinsically disposed to do so, or whether this is induced by the larger environment of the crystal. But it is certainly apparent that this molecule, known for 202 years now, is still of modern interest and relevance. ‡My grasp of quantities was rather vague, and I set out 2-3 mounds of the stuff on the garden path, possibly as much as 1g each. One needs to wait an hour or so to allow the mound to dry out. The first visitor to the garden following this drying out period was my mother, who had come to put the washing on the line, a line that followed exactly that of the path itself. She did not quite know what to make of the loud crack originating from her shoes, but was much more alarmed by the substantial cloud of purple vapours that enveloped her feet and slowly rose upwards. Well, if you have not read any chemistry books, what would you make of such an experience? I will also record here my other experiment in the garden. My father had put a very old fridge there, prior to arranging its permanent removal. I pondered what the refrigerant might be, and so rather optimistically sawed through the pipe with a test tube ready to collect any liquid that might flow out. It was SO2, and not un-naturally I fled the scene. This must have been at dusk, since I only returned the following morning. My parents proud and joy was a tenderly cared for lawn. That morning, it was pure white. It was bordered by campanula, which were still resolutely blue, making for a rather nice contrasting colour scheme. But with no explanation to hand to give my parents for my inadvertent garden redesign, I instead went to school. The odd thing was that when I returned that afternoon, absolutely no mention was made by either parent of the strange change in colour of the lawn (it was back to normal about two weeks later, with no permanent harm done). To this day, I have no idea what they thought might have happened. Well, if you have not read any chemistry books, what would you make of such an experience? †I had somewhat underestimated the drying time, and so had to leave the school laboratory for my next lesson. About halfway through the next laboratory class, the new set of students started to be alarmed by the loud cracks coming from the water-pump gutter running down the middle of the laboratory bench. More to the point, the teacher did not know how to stop these noises, which continued to punctuate the rest of his class. To describe him as annoyed at the end of that class is putting it mildly. At least, he HAD read some chemistry textbooks. This entry was posted on Monday, December 1st, 2014 at 10:14 am and is filed under Interesting chemistry. You can follow any responses to this entry through the RSS 2.0 feed. You can leave a response, or trackback from your own site. Halogen bonds 3: “Nitrogen tri-iodide” is licensed by Henry Rzepa under a Creative Commons Attribution-Noncommercial-Share Alike 3.0 United States License.